Laparoscopic surgeries are less invasive, cutting-edge alternatives to traditional pet surgeries. In a laparoscopic surgery, a camera is inserted into a small incision in the abdomen. With this camera, the veterinary surgeon can see internal organs magnified on a monitor, allowing for more precision. To conduct the actual surgery, small “ports” are created in the abdomen to insert tools, but because of the camera, large incisions are not needed. 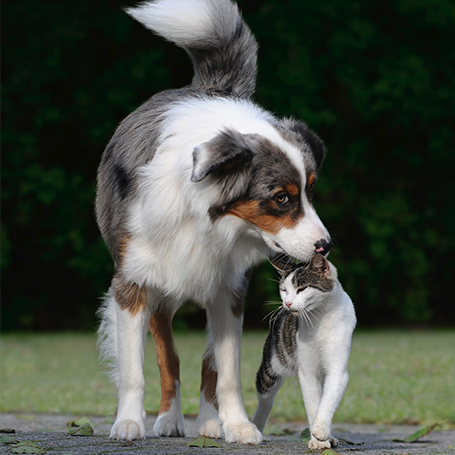 When you have your cat or dog spayed, her ovaries are removed to keep her from ever becoming pregnant. We highly recommend laparoscopic spays, as they offer your pets less pain and shorter postoperative recovery times than traditional spays. In traditional spays, pets receive 2” to 3” incisions, and surgeons tear the ovaries from the abdominal wall. This tearing causes bruising and pain, and usually, pets receiving traditional spays must remain at the hospital overnight. Then, it can take up to three weeks for the incision and bruising from the tearing to heal. The cameras utilized with laparoscopic spays, however, allow for more exactness, so surgeons can cauterize the ligaments that attach the ovaries to the abdominal wall. This greatly reduces trauma and postoperative pain. Generally, pets heal faster after laparoscopic spays, since trauma is reduced and the large incisions used in traditional spays are not necessary.